^ 原論文: Szilard, L. (1929). “Über die Entropie­verminderung in einem thermo­dynamischen System bei Eingriffen intelligenter Wesen”. Zeitschrift für Physik 53 (11–12): 840–856. doi:10.1007/BF01341281. 再録: Feld and Szilard (1972) pp.103–119. 英訳: “On the Decrease of Entropy in a Thermo­dynamic System by the Intervention of Intelligent Beings”. Behavioral Science 9 (4): 301–310. (1964). 再録: Feld and Szilard (1972) pp.120–129, Leff and Rex (2003) pp.110–119. ^ Lanouette (1992) pp.59–66. Leff and Rex (2003) pp.14–17. ウィアート他 (1982) pp.11–13. ^ Monod, Jacques (1972) Foreword, in Feld and Szilard (1972) pp.xvi–xvii. ^ 原論文: Szilard, Leo; T. A. Chalmers (1934). “Chemical separation of the radioactive element from its bombarded isotope in the Fermi effect”. Nature 134 (22 Sept.): 462–463. doi:10.1038/134462b0. 再録: Feld and Szilard (1972) pp.143–144. ^ ドイツ特許: (線形加速器) Appl. No. S.89 028. (サイクロトロン) Appl. No. S.89 288. ^ Lanouette (1992) p.101–102. Telegdi (2000) pp.26–27. ^ アインシュタインとシラードの冷蔵庫に関する特許: (液体金属ポンプ) ドイツ特許 Pat. No. 476 812, イギリス特許 Pat. No. 303,065, Feld and Szilard (1972) pp.532–542. (ガス冷蔵庫の改良) アメリカ特許 No. 1,781,541, A. Einstein and L. Szilard (1930-11-11) “Refrigeration” (Google Patent Search, 2008-05-24 閲覧). ^ ローズ (1993) 上 pp.16–17 (原書: pp.20–21). Lanouette (1992) pp.83–84. Wigner (1992) pp.94–95. ^ イギリス特許: (核変換) Pat. No. 440,023, (連鎖反応) Pat. No. 630,726, Feld and Szilard (1972) pp.622–651. アメリカ特許: (黒鉛型原子炉) Pat. No. 2,708,656, Feld and Szilard (1972) pp.691–696, E. Fermi and L. Szilard (1955-05-17) “Neutronic reactor” (Google Patent Search, 2008-05-24 閲覧). ^ ローズ (1993) 上 pp.346–347, 下 p.189 (原書: pp.203–204,507–508). ^ ローズ (1993) 上 pp.170–172 (原書: pp.107–108). Lanouette (1992) pp.23–24. ウィアート他 (1982) p.2. ^ Lanouette (1992) p.36. ウィアート他 (1982) pp.3–4. ^ ローズ (1993) pp.6–7 (原書: p.15). Lanouette (1992) pp.38–42. ウィアート他 (1982) pp.6–8. ^ ローズ (1993) 上 pp.7–9 (原書: pp.15–16). Lanouette (1992) pp.52–57. ウィアート他 (1982) pp.8–10. ^ Lanouette (1992) pp.57–59. Wigner (1992) pp.95–96. ^ 博士論文: Szilard, L. (1925). “Über die Ausdehnung der phänomenologischen Thermodynamik auf die Schwankungs­erscheinungen”. Zeitschrift für Physik 32: 753–788. doi:10.1007/BF01331713. 再録: Feld and Szilard (1972) pp.34–69. ^ ローズ (1993) 上 pp.13–16 (原書: pp.19–20). Lanouette (1992) pp.58–60. ^ ローズ (1993) 上 pp.16–17 (原書: pp.20–21). Lanouette (1992) pp.89–95,100–102,103–105,107–110. ウィアート他 (1982) pp.12–13. ^ 原文献: Wells, H. G. (1928). The Open Conspiracy: What Are We to Do With Our Lives?. (2006) San Diego, CA: Book Tree, ISBN 978-1-58509-275-8. ^ ローズ (1993) 上 p.4 (原書: p.14). Lanouette (1992) p.96. ^ ローズ (1993) 上 pp.18–19 (原書: pp.21–22). Bernstein (1987) p.xxv. ウィアート他 (1982) pp.28–38 (資料1). ^ ローズ (1993) 上 pp.26–28 (原書: pp.25–26). Lanouette (1992) pp.111–116. ウィアート他 (1982) pp.15–17. ^ Lanouette (1992) pp.116–127. ウィアート他 (1982) pp.17–19, pp.38–47 (資料2–4). ^ Bernstein (1987) p.xxvi. Lanouette (1992) pp.116–127. ^ 講演の内容を伝えるネイチャー誌の記事: “Atomic Transmutation”. Nature 132: 432–433. doi:10.1038/132432a0. ^ 原文献: Wells, H.G. (1914). The World Set Free. http://www.gutenberg.org/etext/1059. ^ ローズ (1993) pp.3–4,22–32 (原書: pp.13–14,24–28). Lanouette (1992) pp.131–138. ウィアート他 (1982) pp.19–21. ^ シラードから英海軍への手紙: Feld and Szilard (1972) pp.733–734. ^ ローズ (1993) 上 pp.346–347,367–369,386–388 (原書: pp.203–204,213–215,224–225). ウィアート他 (1982) p.23. ^ 原論文: Szilard, Leo; Chalmers, T.A. (1934). “Detection of neutrons liberated from beryllium by gamma rays: a new technique for inducing radioactivity”. Nature 134: 494–495. doi:10.1038/134494b0. 再録: Feld and Szilard (1972) pp.145–146. ^ ローズ (1993) 上 pp.369–370,381–383 (原書: pp.215–216,221–222). Bernstein (1987) pp.xvi–xvii. Lanouette (1992) pp.145–149. ウィアート他 (1982) pp.21–26, pp.49–62 (資料6–15). ^ Bernstein (1987) p.xxvii. Lanouette (1992) pp.141–142,151. ウィアート他 (1982) pp.47–49 (資料5). ^ ローズ (1993) 上 pp.409–411 (原書: pp.236–237). ウィアート他 (1982) pp.26–27. ^ ローズ (1993) 上 p.470 (原書: p.266). ウィアート他 (1982) pp.69–70, pp.79–81 (資料19–21). Wigner (1992) pp.193–194. ^ 原論文: Halben, H. von, F. Joliot, and Lew Kowarski (1939). “Liberation of neutrons in the nuclear explosion of uranium”. Nature 143: 470–472. doi:10.1038/143470a0. ^ ローズ (1993) 上 p.520 (原書: 295–296). ウィアート他 (1982) pp.73–78, pp.91–106 (資料29–48). Wigner (1992) p.196. ^ ローズ (1993) 上 pp.522–523 (原書: p.297). ^ ローズ (1993) 上 pp.531–540 (原書: pp.303–308). Wigner (1992) pp.198–201. ^ ローズ (1993) 上 pp.555–559 (原書: pp.315–317). ウィアート他 (1982) pp.112–113. Wigner (1992) pp.202–204. ^ ローズ (1993) 上 pp.581–583,586–588 (原書: pp.331–334). ウィアート他 (1982) pp.150–151. Wigner (1992) pp.204–205. ^ ローズ (1993) 下 pp.8–13. Wigner pp.222–223. ^ ローズ (1993) 下 pp.80–83. ウィアート他 (1982) pp.189–193. ^ Bernstein (1987) pp.xxxi–xxxii. ウィアート他 (1982) pp.197–234 (資料93–98). ^ ローズ (1993) 下 pp.181–192 (原書: pp.502–510). Bernstein (1987) p.xxxii. ウィアート他 (1982) pp.192–194, pp.196–234 (資料93–98). ^ ローズ (1993) 下 (原書: pp.606–607). Lanouette (1992) pp.259–260. ウィアート他 (1982) p.235. ^ ローズ (1993) 下 pp.402–406. Bernsein (1987) p.xxxv. Lanouette (1992) pp.263–266. ウィアート他 (1982) pp.237–241. ^ Bird and Sherwin (2005) pp.292–293. Lanouette (1992) pp.266–267. ^ Bernstein (1987) pp.xxxv–xxxvi. Lanouette (1992) pp.267–269. ウィアート他 (1982) pp.242–243. ^ Bernstein (1987) pp.xxxvi–xxxvii. Bird and Sherwin (2005) pp.302–303. Lanouette (1992) pp.269–275. ウィアート他 (1982) pp.243–245. ^ ローズ (1993) 下 p.604. Lanouette (1992) pp.277–278. ウィアート他 pp.301–302 (資料117). ^ ローズ (1993) 下 pp.604–605,608–609. ウィアート他 (1982) pp.291–293. ^ Bernstein (1987) p.xxxviii. ウィアート他 (1982) pp.293–295. ^ 原論文: Szilard, Leo (1960). “How to live with the bomb and survive: The possibility of a Pax Russo-Americana in the long-range rocket stage of the so-called atomic stalemate”. Bulletin of the Atomic Scientists 16: 58–73. http://books.google.com/books?id=mgkAAAAAMBAJ&pg=PA58. ^ Bernstein (1987) p.lv. Feld and Szilard (1972) p.15. ^ 原文献: Szilard, L. (1961). The Voice of the Dolphins: and Other Stories. (拡張版, 1992), Stanford University Press, ISBN 978-0-8047-1754-0. ^ Bernstein (1987) p.lxiii. Lanouette (1992) pp.465–480. ^ Bernstein (1987) pp.xlvi–liii. Lanouette (1992) pp.67–71. ^ Bernstein (1987) pp.xxi–xxiii. Lanouette (1992) pp.334–347. ^ ローズ, リチャード 『原爆から水爆へ』 小沢千重子、神沼二真 訳、紀伊國屋書店、2001年、〈下〉pp.786,895–896。ISBN 4-314-00890-3。 (原書: pp.513–514,582). ^ Rabinowitch, Eugene (1964). “James Franck, 1882–1964; Leo Szilard, 1898–1964”. 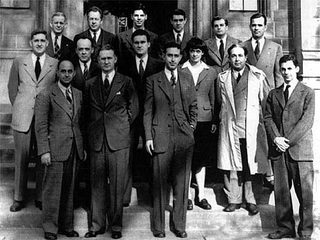 Bulletin of the Atomic Scientists 20: 16–20. http://books.google.com/books?id=ygcAAAAAMBAJ&pg=PA16. ^ Lanouette, William (1998). “Prescience and Conscience: Leó Szilárd (1898–1964)”. Europhysics News 29: 92–93,123. doi:10.1007/s00770-998-0092-2. ^ 湯川秀樹 『平和への希求』 豊田利幸 編、岩波書店〈湯川秀樹著作集5〉、1989年。ISBN 978-4-00-091425-3。 『科学者の責任: パグウォッシュ会議の感想』1957年7月, pp.153–157. ^ Wyden, Peter H. (1984). Day One: Before Hiroshima and After. New York: Simon and Schuster. ISBN 0-671-46142-7.